I have a used Hasselblad A12 back for sale. GROUND GLASS FILM BACK HOLDER. The back side is 145mm x 145mm and there are holes to screw to whatever. I think this is from a de vere copy enlarger. The springs are good and its surprisingly light. A Mamiya Universal or Super 23 6x9 cm smoked glass focusing screen unit with a Mamiya cut film holder type J, The focusing unit is in a nice condition and it is working as it should, the Mamiya cut film holder is in a good external condition, but it needs a bit of paint inside and new seals fitted to bring it back to its full potential. Keep your 4x5 sheet film holder safe from marks and scratches. Option 2 - is slightly bigger - but can hold more holders (can do upto 4/5, but three looks good). (images with white background is option 2). Elastic end for universal fitting. Lightweight material. 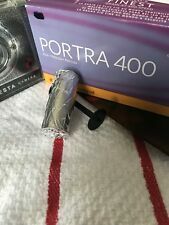 For Bronica ETR. ETR System. ETR 120 Back. 120mm Film. Take up Reel. Serial number: 8160905. Reproduction Wetplate portrait head brace. Not as advanced in features compared to original (or reproduction models) but saying that, the alternate models are USD 600.00 - this version is no where near the price. This is a nice Bronica SQ 6x6 120 film back complete with 120 insert & metal dark slide in very good condition. The back shows average wear from normal use and has been checked and tested to work properly with no problems. This is the Rolleikin kit, to adapt your Rollei to shoot 35mm film. Everything is in excellent condition. =Actual item pictured=. 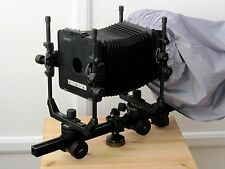 ZENZA BRONICA POLAROID FILM BACK FOR ETRS ETRSi 6 x 45 format in absolute mint condition. Comes with original box also in excellent condition. I don’t think this has ever been Used. Dispatched by Royal Mail 2nd Class. Lightweight deluxe material. 140x140cm in size. 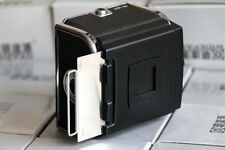 [NEW] (for) Hasselblad Dark Slide Holder Accessory. It is a basic, but a clever idea - it holds the dark slide on your magazine (saves scratching or damaging the slide). For the older style magazine such as the A12, A16. Nicely made -- the cloth has a head band attached for critical focusing - as seen in images. Lightweight material. ([NEW] Hasselblad Magazine Case. Fits Hasselblad V series film back C12 \ C16 \ C24 \ A12 \ A16 \ A24 \ A32 \ E12 \ E16 \ E24 (but not the A70) - note: magazine not included - it is just the case). Not official Hasselblad. EXC++ EASTMAN 8x10 ALL WOOD SHEET FILM HOLDER, GORGEOUS! EASTMAN 8x10 ALL WOOD SHEET FILM HOLDER. EXCELLENT CONDITION, GORGEOUS! BEAUTIFUL PIECE IN WORKING ORDER. Free local pickup is available from our warehouse in Louisville, Colorado or other agreed upon location. 220 film back for a Mamiya RB67. Graded: Excellent Minus. Glass heavily marked or fungus. Marks that may be considered unsightly, though will not affect the picture. Like New Minus: Close inspection reveals slight signs of wear. Hard to find piece. 0130009 apr19 16. Original Box. We have a number of these in similar condition. Graded: Bargain. Could do with a detailed clean. Marks that may be considered unsightly, though will not affect the picture. J: Not usable without repair or cleaning. Used, nice condition. See photos for condition. Have not film tested but these are relatively simple devices. The serial number of the film carriage matches that of the outer shell. Other than that it is in excellent condition, no dents or dings. We'll make you happy if at all possible. Nicely made -- the cloth has a head band attached for critical focusing - as seen in images. Lightweight material. Pull strings for universal fitting. Here is a box of 12 Eastman Film Sheaths 5x7 size. This is a Bronica SQ-Ai 6x4.5cm SQ-i 120J Complete Film Back. Mint in box with insert, slide, take up spool, instructions, styrofoam protections and blank warranty card. No signs of use. Serial number 2331857. All of the dark slides are light-tight. FujiFilm Instant Film Holder for GX680. Get Supersized Images & Free Image Hosting. Zenza Bronica M-Bracket / Mounting Bracket. For use with Bronica all ETR, SQ and GS-1 Bronica series. The holders are in perfect working condition. DOS 30147 Black Hasselblad 12 vues . Dos pour appareil photo moyen format Hasselblad. Dans sa boîte d'origine sans notice. Type 30147. Mots clés : Leica, Bronica. This is an Essenkay 828 Color Film Adapter. Essenkay 828 Color Film Adapter. Original Manual. Great quality opaque surface Thickness : 2mm. Nikon DATA BACK MF-12. battery needed: 2x LR 44 (not included). With original box, without instructions.